Zlatan Ibrahimovic became Paris Saint-Germain's all-time leading goalscorer as the Swede scored two penalties in quick succession on the stroke of half-time to turn the tables on Marseille. This match started off with a minute of clapping and then the real game was underway. PSG kicked the game off and played the possession game for the first minute or so. Marseille then got the ball and set off on an attack and an early shot from Cabella was saved by Kevin Trapp in the Paris goal. Marseille's defence was on high alert as Ibrahimovic took the ball but lost it seconds after. 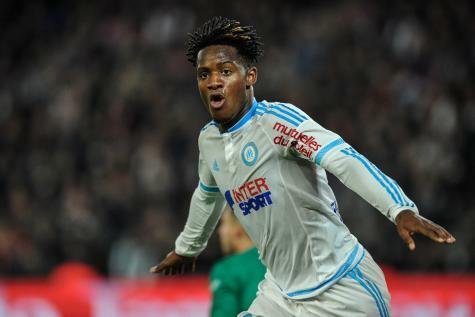 Marseille were putting their pacy players to the test and came close to the opener. Marseille had a corner and David Luiz was in to head the ball away. Cabella got onto Alessandrini's cross, Maxwell blocked it but Trapp jumped the highest to save th ball from going any further into ththe box. Di Maria as pulled down and Barrada crossed the ball but it was cleared out for a corner, yet again the corner was cleared. Batshuayi took a speculative shot but Trapp stooped the shot once again. He sent a ball up field but it was too heavy for Di Maria. Aurier passed the ball to Ibrahimovic. The shot had no power and Mandanda calmly got the ball into his grasp. Diarra crossed the ball in but Maxwell caused the hand ball and the free kick was cleared by PSG. 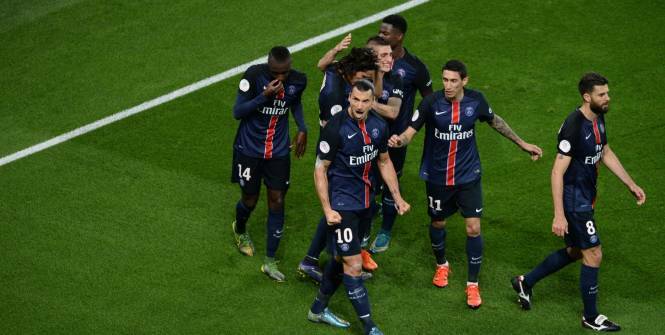 Ibrahimovic was in with Cavani but Mandanda saved from the Ibrahimovic shot. Barrada and Alessandrini were steadily and a real threat to PSG on the least and write. Di Maria ran seventy yards with the ball but he lost it. Veratti got a ball into the box and it took two efforts for Ibrahimovic to get a good shot off but Mandanda saved once again. Di Maria got passed Rolando and his shot was inches wide of the left post. Matuidi and Veratti left it to the 30 minute mark to make an appearance and they both played well and made chances. Barrada crossed the ball in and Batshuayi scored with a header for his 6th goal of the season. Marseille got a free kick and Mandanda blasted the ball out of play. Paris Saint-Germain got a free kick and Barrada got a yellow card and the free kick from Di Maria was cleared by N'koulou and PSG kept trying and trying but nothing came for them to get the game level. Batshuayi played a risky back pass to Mandanda and Ibrahimovic was taken out by Mandanda and it was a penalty and Zlatan Ibrahimovic scored it. 109 PSG goals for Ibrahimovic. Another penalty was given from a handball by Diarra blocking and Ibrahimovic header. He scored the penalty but it has to be reatken. Ibrahimovic try two is scored. Ibrahimovic is PSG's highest ever goal scorer with 110 goals. It was then half time and PSG were leading Marseille by 2 goals to 1. What an intriguing first half in Paris, truly enjoyable for all football fans watching, reading and listen around the world. Could the second half live up to the dramatic first half? The game was back underway with Marseille. Aurier came close to getting his 3rd goal in 3 matches but the ball went wide of the post from an awkward angle. Marseille had a chance to get back and Aurier got a yellow card for fouling Barrada in the box and the penalty was saved by Trapp and Barrada is denied a goal. Still PSG 2-1 Marseille. Cavani had a chance to score but he was offsid and the ball went over the bar anyway. Lassana Diarra picked up a yellow for pulling the shirt of Ibrahimovic. PSG gave no chances to Marseille in the second half, it was all Paris in possession. Cavani had a lot of space but he couldn't pull the trigger in time to beat the challenge of Nkoulou. Paris Saint-Germain were playing around the back and a surprising ball was sent to Cavani but he recklessly hit the ball into row Z. Matuidi took a shot that was always rising and Ocampos and DjaeDjeDje entered the field of play for Barrada and De Cegle for Marseille and Ibrahimovic leaves the field for the introduction of Pastore who played just behind Cavani. Cavani got the ball, passed it across to Pastore, Mandanda saved again and Maxwell's shot was drastically blocked by Nkoulou. Alessandrini took the corner and Batshuayi headed the ball just over the bar. Alessandrini and David Luiz clashed in the box and Lucas Silva was replaced by Sarr for Marseille. PSG were making changes with Di Maria getting replaced by Lavezzi and Marquinhos took the place of Serge Aurier at Right Back. Veratti gained a yellow card and Marseille had a free kick that was cleared away by Paris Saint-Germain. Pastore and Lavezzi played one-two passes but got nowhere. Cabella had the chance of the game but hit the ball straight at Kevin Trapp and it was surely all over. Cabella found the ball at his feet again and he missed and the game was all over. PSG won the game and it was 7 wins in 9 games for Paris Saint-Germain and they beat their arch-rivals at home and the result was, Paris Saint-Germain 2-1 Marseille with an Ibrahimovic brace securing all 3 points for the Parisiens.